At MHR, we believe in giving back to our communities and encourage our employees to do the same. To make the communities where we live, work, play and send our kids to school stronger, we understand volunteering and donating our time is every bit as important as donating our resources. Below are some highlights of events and causes we’ve been involved in recently. Alex Carpenter (pictured, 2nd from left) from our Zanesville office recently participated in the OSCPA Accounting Career Day. 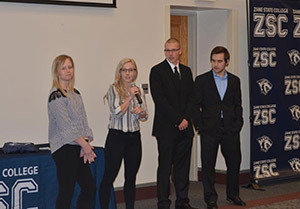 The event helped provide resources and information to college students about the accounting profession and how to get started in a career in accounting. McLain, Hill, Rugg & Associates, Inc. was happy to be a sponsor of this worthwhile event. 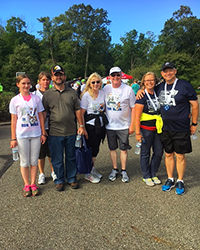 Tim McLain, Michael Harris and Kyle Plummer (pictured, from right to left) along with their families recently participated in the Licking Memorial ‘For Your Health’ 5K Run/Walk. This is a fun event to get the community involved in leading a healthy lifestyle. 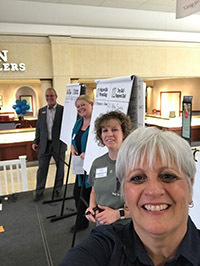 Megan Durst (pictured, 2nd from left) from our Zanesville office was involved in the recent 32nd annual Carr Center Cake auction where over 400 cakes were auctioned off to raise money for the Carr Center operations. Over $117,000 was raised for this worthwhile cause. Michael Harris (pictured), from our Newark office, has been involved annually in the International Young Eagles Day events since 2003. During this day each year, he flies kids ages 8 to 17 on a free plane ride. 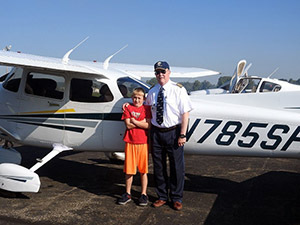 To date, he has flown more than 400 children during these worthwhile events.